On December 9th 1965 THUNDERBALL had its world premiere in Tokyo, Japan. That is exactly 50 years ago today. 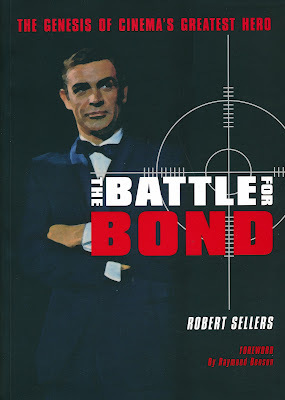 To celebrate this this blog post is about the "must have" book about the making of the film THUNDERBALL called THE BATTLE FOR BOND and written by Robert Sellers. THE BATTLE FOR BOND was published in 2007 by Tomahawk Press. Its has 264 pages and digs deeply into the making of the film Thunderball. As many of you know Ian Fleming "stole" the plot for his book Thunderball (released in 1961) from a screenplay that Ian Fleming had written together with Kevin McClory and Jack Wittingham. The trio went into court to battle this out and many says that the press from all of this was eventually what killed Ian Fleming (and booze and 60 cigarettes a day). The book features unpublished letters, private lawsuit documents and cast-crew interviews; there are also five Thunderball screenplays, two by Fleming, three by Whittingham, and two treatments by Fleming that document the creation and development of this James Bond project. The books was withdrawn from the market after the Ian Fleming estate apparently threaten Tomahawk Press with a lawsuit for publicise documents that they said that they had copyright to. More about that story can be found here. A second edition was printed but without the Ian Fleming documents. A first edition of this book is what I have in my collection. and they sometimes occur on Ebay. At the moment there are two compies for sale. One of them costs only £30 so I wonder if that seller actually knows what he is selling. I guess it must be illegal to sell this copy still? Below you can see a 2008 BBC news story about the banning of the book.